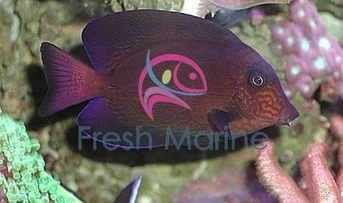 https://sep.yimg.com/ay/yhst-33477391359232/chevron-tang-ctenochaetus-hawaiiensis-hawaiian-bristletooth-hawaiian-surgeon-fish-black-surgeonfish-5.jpgChevron Tang - Ctenochaetus hawaiiensis - Hawaiian Bristletooth - Hawaiian Surgeon fish - Black Surgeonfish Expert Only!!! Not Cover Under Arrive GuaranteedPeaceful100 Gallon11 inchesYesHerbivore, Greens, Pellet, FlakeCentral PacificAcanthuridaeSmall 1" - 2"
The Chevron Tang, also known as the Hawaiian Bristletooth, Hawaiian Surgeonfish, or Black Surgeonfish, has an oval body shape with radiating, bold markings that change with maturity. As a juvenile, it is bright orange with violet markings on the body and fins. When mature, the bright markings turn an olive brown color with thin lines on the body. A 75 gallon or larger aquarium is necessary to provide plenty of swimming room. Chevron tang aggressive towards other Tangs and may be harassed by its own species, but is peaceful with other fish and sessile invertebrates. It is best to house only one specimen per tank. Maximum Size: This species grows to 11 inches in length. General Size: This Chevron Tang is about eight to nine inches in length. Minimum Tank Size Suggested: A 75 gallon or larger aquarium provides a good environment for these Chevron Tang . Tank Conditions: The Chevron Tang should ideally be kept in temperatures between 72 and 78 degrees Fahrenheit. A pH value of 8.1 or 8.4, and a specific gravity of 1.020 to 1.025 should be maintained. When kept with invertebrates, the specific gravity range should be 1.020 to 1.025, for the invertebrate species. In a fish only aquarium, the specific gravity should fall between 1.020 and 1.023. Habitat: The Chevron Tang occurs in Hawaiian waters, but the distribution of this species extends from Hawaii southward to central Polynesia and westward through Micronesia and Melanesia, but it apparently does not extend to the Philippine Islandsand central and south pacific. Feeding and Diet: The Chevron Tang fish is a herbivore. Its main diet consists of marine algae, having an unusually long digestive tract to digest the plant matter they eat. They are constant feeders and in nature spend most of their day grazing. A habitat with algae growth is good for them, which in turn helps to keep the algae in an aquarium cropped and in check.